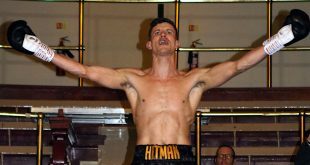 Sunday afternoon, at the Municipal Hall (Muni) Colne, Steve Wood / VIP Promotions hosted a fight-card which featured four bouts. As always, it was a good atmosphere and a great way to spend a Sunday afternoon! The contest between Stevie Taylor and Carl Wilson did not go ahead because Taylor had Appendicitis. Southpaw – Shah, who hadn’t fought in 15 months, faced tough veteran Allen in a four round contest. With ‘bags of attitude’ - the Blackburn man starts to ‘showboat’ in the second frame and throws some sweeping roundhouse shots. Allen – who seems to have as much vocal support from the Colne crowd as Shah – is forced to take a breather in the third frame from a low blow. 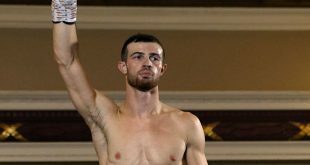 Finding further success with a long-reaching uppercut - Shah gets the points win (40-37) and improves to 6 wins (2 by KO) while Allen’s record now stands at 18 wins (5 by KO) 96 losses (15 by KO) and 7 draws. Blackledge (aka Robbo) faced late opponent Goodwin who’d had just a few hours notice and had travelled from Hull. 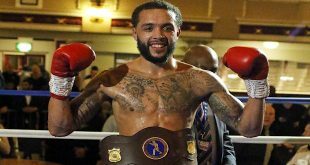 Goodwin gets a bloody nose in the second and - looking tired – the Hull boxer finds himself on his knees in the third, it’s a no knockdown though and he slowly gets to his feet – looking very weary. The nose is a mess too by now and he must have been glad there was only one round left. Shayne ‘The Pain’ (aka Singy) always has a good crowd support behind him and yesterday was no exception – although there was a tinge of sadness as Singleton honoured his deceased friend – Gary, before boxing commenced - insisting the crowds join him in applause. A smiling Singleton looked confident as he faced his opponent. Warburton though (who always ‘comes to have a go’) for me – gave one of his best performances to date. Almost cobra-like – he squirmed out of Singleton’s reach. He lands a decent left in the first round and Singleton clearly ‘felt’ it, but the local man came back with a decent shot of his own to settle the score. Singleton then lands a good shot near the end of the second frame and steps it up a gear in the third. Warburton goes down to the canvas but it’s a no knockdown. 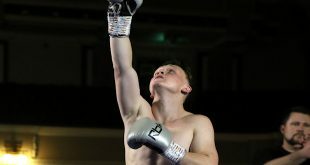 Singy, with long reaching shots targets the head and – as Warburton leans back – the Colne boxer lands a right hook just behind the left ear of his opponent (he seemed to look for that gap a few times). A good all-action fight between both men, Singleton getting the points win 60-54 much to the delight of the Singy supporters. 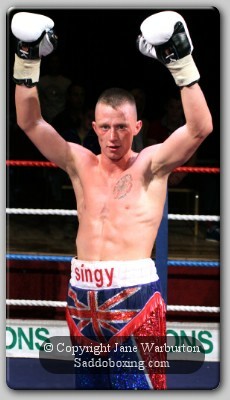 Singleton improves to 8 wins (2 by KO) while Warburton’s record stands at 3 wins 21 losses (2 by KO) and 2 draws.